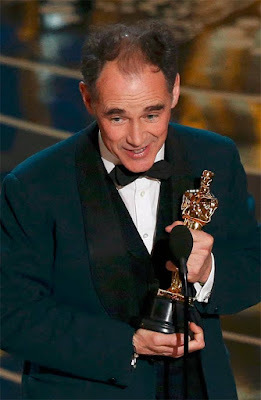 Mark Rylance was awarded the Oscar for Best Supporting Actor at the 88th Annual Academy Awards for his role as a Russian secret agent in Steven Spielberg's Cold War-era film Bridge of Spies. Other nominees in the category were Sylvester Stallone (Creed), Mark Ruffalo (Spotlight), Christian Bale (The Big Short), and Tom Hardy (The Revenant). This was the first Oscar nomination and win for Mark Rylance.